It was a sweltering, hellish afternoon in Palm Desert. The temperature on my phone read 106°F. The sun was beating down on my entire body. I could feel my face melting. 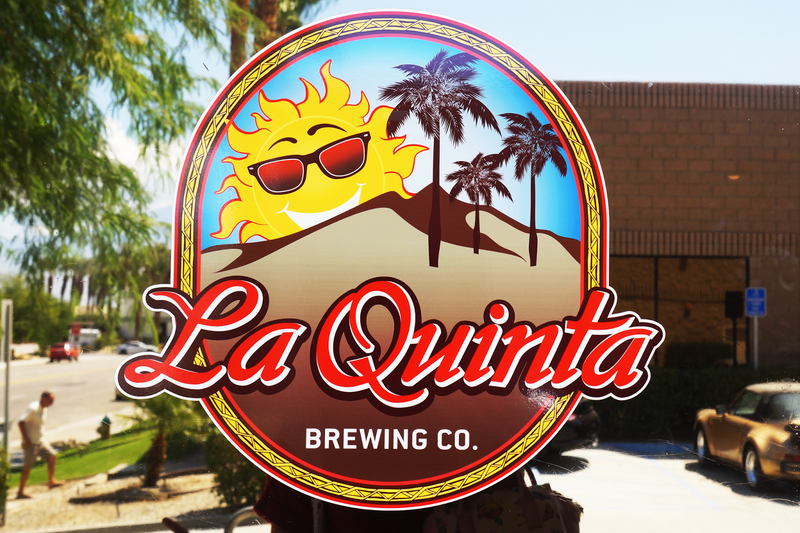 I wiped away a bead of sweat from my temple as I sought refuge in the form of a brewery, La Quinta Brewing Co.* to be exact. I spotted their logo & name sprawled on the door & made my way inside. The taproom was petite with additional seating in the back. Metal bar stools lined the windows. The nifty wooden bench by the entrance was littered with games like Jenga, Connect 4, & a beer trivia game. The walls were painted a bold burnt yellow. Decorations were minimal with a barrel & stools placed here or there to rest on. The brewery was a haven in the heat. Upon entering, it felt like a blissful blizzard, a flurry of wind tickling my hair & chilling my spirit & soul. It's the perfect place to cool off with a soothing drink in hand. Patrons trickled in & out, chatting amongst one another while sipping their beers. 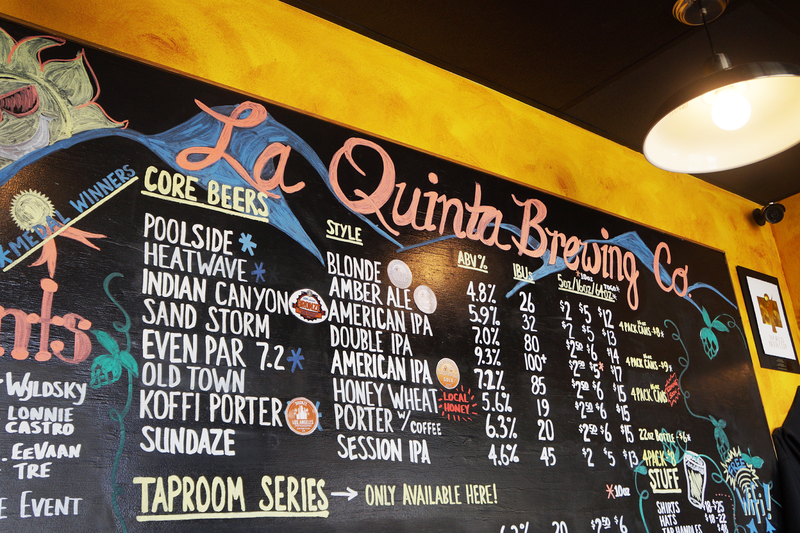 La Quinta Brewing Co. has two locations, the brewery taproom I went to & the Old Town Taproom just a few miles away. The brewery is young, around two & a half years old, but has already received its share of awards. I tasted everything they had on tap. 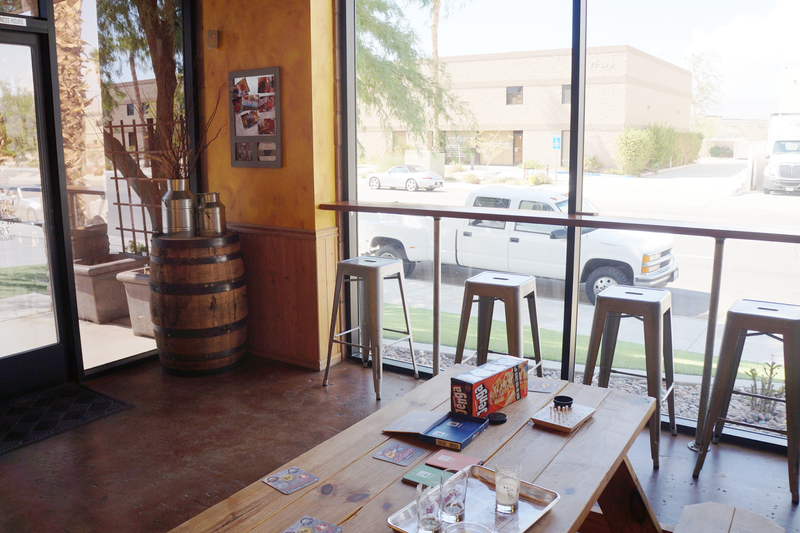 The Palm Springs brewery had a nice range of ales, IPAs, & porters. 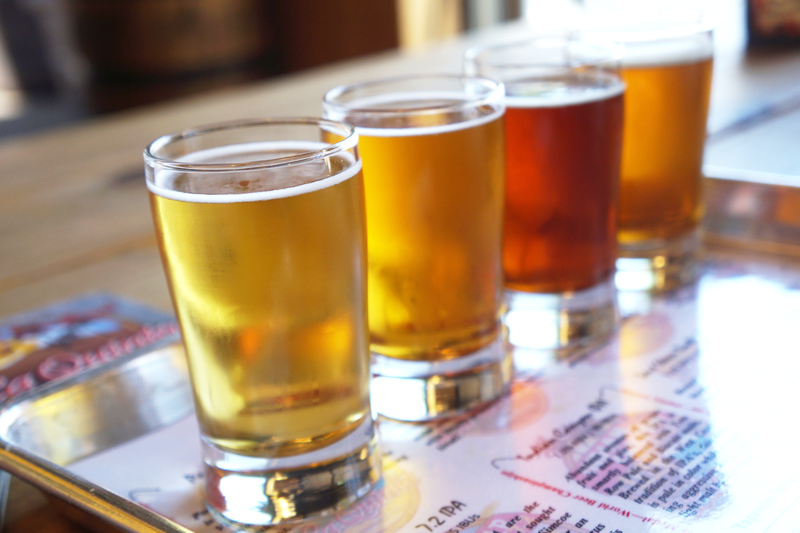 Most everything had a classic, timeless taste to it but there were three beers that stood out the most. Sundaze Session Ale - With grapefruit, melon, lime, gooseberry, & passion fruit, the citrus tones are prevalent. 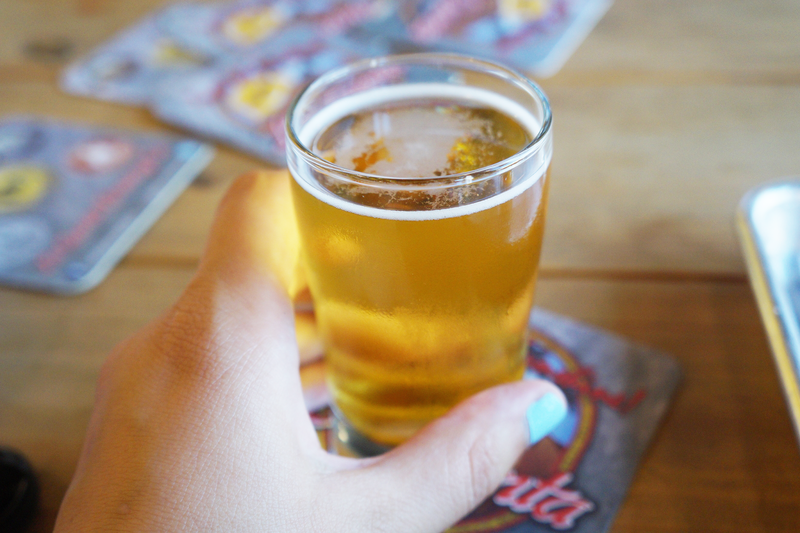 The ale is zesty & fresh on the tongue. Indian Canyon IPA - This beer slightly reminded me of Citrus & Piney from Lost Abbey but with a paler, lighter malt background. This award-winning beer is worth a shot. Koffi Porter - Slightly chocolaty & certainly coffee-y. They brew with chocolate, adding local coffee beans after fermentation. It was the smoothest beer of the bunch. I could see myself sipping it on a cool winter day. 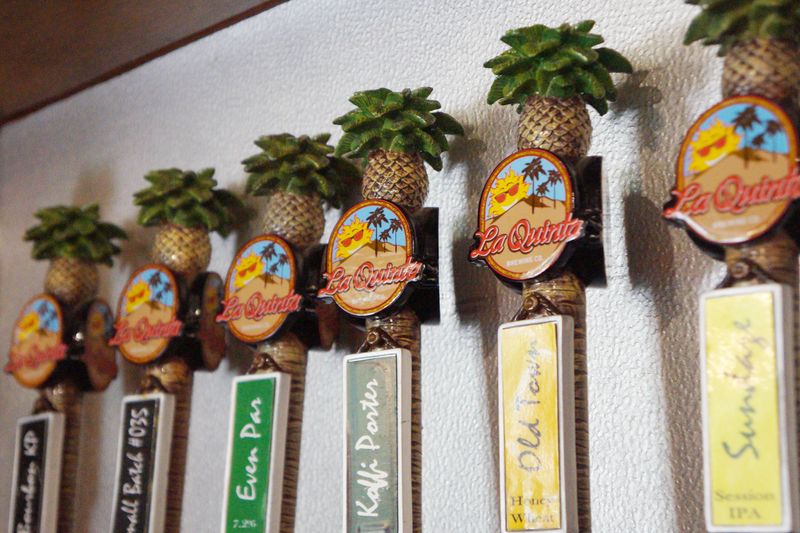 La Quinta Brewing Co. is a great pitstop to cool off with a beer in hand. Sit at the wooden bench & share a flight or two with friends to get a feel of your favorite. I ended up spilling one of the tasters on myself (pictured above, full outfit here) due too a light curve in the metal taster tray. Since it was 100+ degrees out, it dried up in no time. 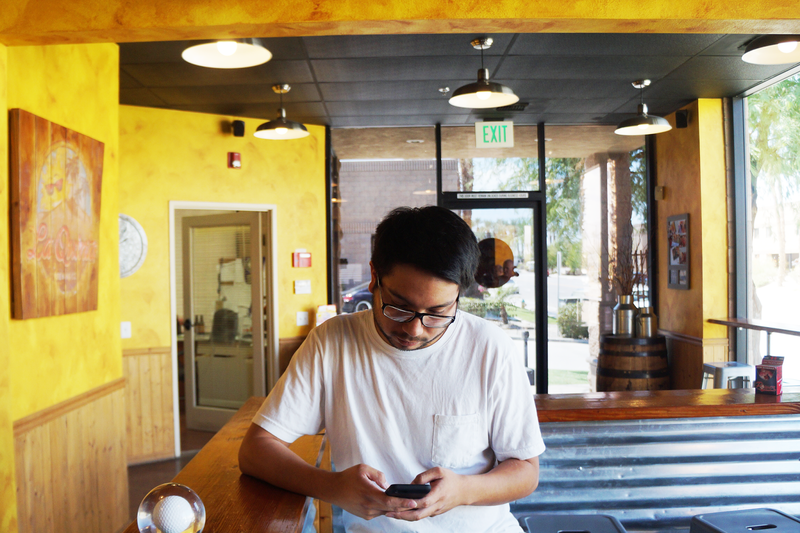 Play some games & enjoy a small sanctuary from the harsh Palm Desert summer. LOVE breweries. I'll have to add this to the list. That Koffi porter is calling my name! I have always wanted to visit a brewery but the problem is trying to find a babysitter for our little one. I think they would frown on us bringing a little tot along with us. LOL! I'm not a massive fan of beer (meaning I hate the stuff) but the ambience looks amazing! It has been so hot lately, hasn't it! Looks like the perfect escape in the afternoon! I love a good brewery! This one looks amazing! Love a good and cold beer on a really hot day! This place looks so amazing and it looks like you have a great time! Looks like a very cool place indeed! 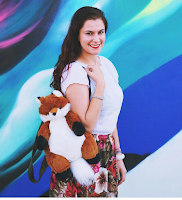 Thanks for sharing Carmen! What a cool place! 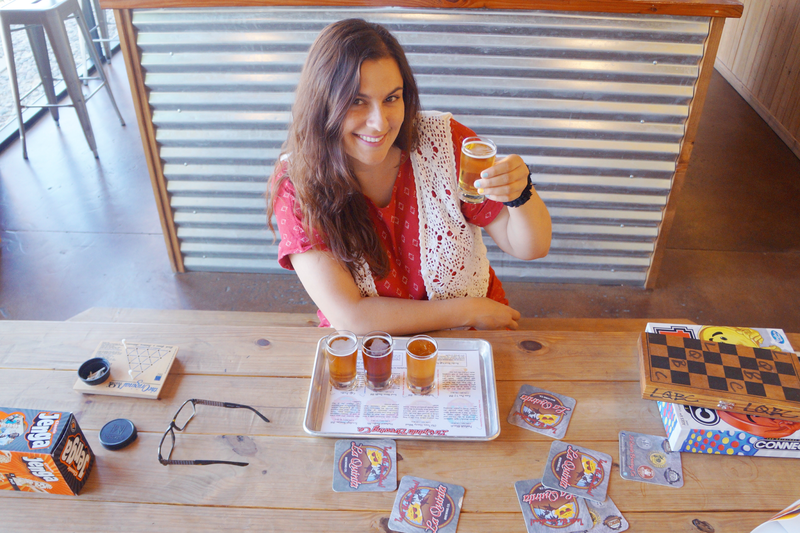 My husband and I have visited breweries while traveling, and it is always fun.